The previous day had been a lot of travelling, walking, playing and eating. We had to admit that the kids were tired and needed a 'late start day'. However, we also knew that the best time to see a fish market was in the early morning when the boats brought the catch in, and when the dealers bartered among themselves for the prized pieces. Hence, we came up with a strategy for daddy to hit the market as early as his tired body could take him there, and then link up with him later on in time for a good fishy meal. Take the metro to Jagalchi Station and exit at Exit 10. A street map located right outside the metro station. I woke early and left the hotel room at 6 am while it was still dark. I was wrapped up in multiple layers to deal with the freezing temperatures. The metro began operating before 6 am so it was convenient to use it to get to the market. It was nice to see the stations some what empty and void of the usual activity we've become accustomed to. Picking up something to eat and drink from a minimart along the way, I found my way to Exit 10 at Jagalchi Station and followed the first right turn toward the wharf to see the first signs (and smells) of the market. First right turn toward the market. Some people say "you smell the market before you see it". The metal banner welcoming you to Jagalchi Fish Market! I arrived at about 7 am and decided to start from the west and make my way to toward the east end, and then back to the station to meet my family. The market appeared to be sectioned into three or four distinct parts. From the west, the first section focused on dried products, with a mish mash of stalls focusing on other non-marine produce that you would otherwise also find in any ordinary traditional market here such as fruit, vegetables, craft, and daily necessities. This portion is linked to a large area sheltered by a high arching canopy know as 'Sincheonji Market', focusing on all sorts of fresh animal and plant produce. I only skimmed this portion and came back to it shortly before meeting my family as I wanted to get to the fisheries as early as possible to catch the morning action. The strawberries were in season and we ate a punnet each day in Busan. The local butcher is carving up pork this morning. Side roads next to Sincheonji Market selling fresh produce. The seafood here at Sincheonji Market areas were mainly processed items, mostly salted, preserved, dried versions of what we will see later. Some stalls were simply covered in salted fish. Drying out the rays and the ribbon fish. Pen shells (Atrina c.f. pectinata) displayed alongside oysters, small octopuses, whelks, prawns and other goodies. Crab sashimi in red sauce. Skewered whelks and sea cucumbers! Lady selling dried squid and fish overcome by sleep as she awaits the next customer. A large section of this area alongside the walking path was lined up with little 'restaurants' heating up their stoves, preparing breakfast fare for the early morning workers who would be arriving soon. Many of these stalls have large tables with built in pots brewing hot soups and customers would simply sit around these pots and pick out whatever they wish from the pots. There was also an assortment of deep fried seafood. 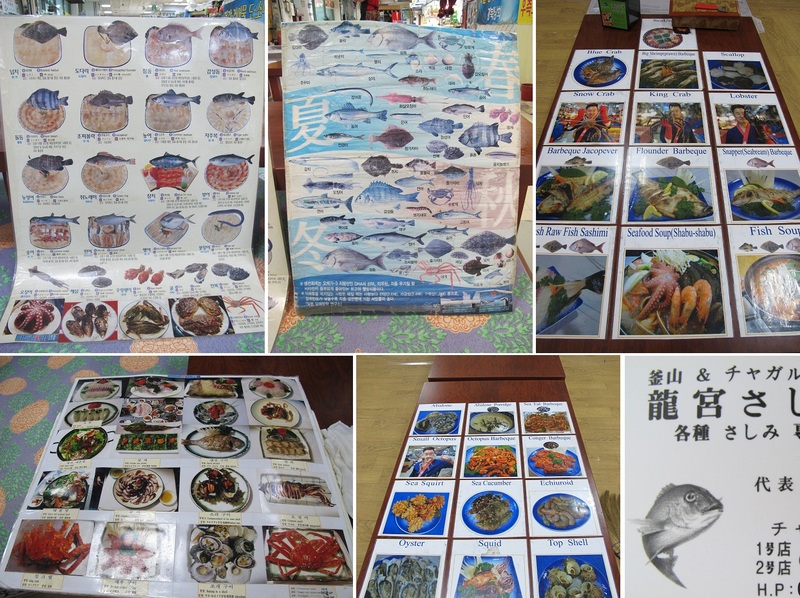 ﻿I decided to try some of this dried stuff and found someone who was willing to sell me just one ribbon fish. It wasn't easy to persuade him to sell just one as a bundle of 10 was sold for 10,000 won, and there was no price tag for just one piece. When I finally convinced him to sell it to me, I decided it was good enough to eat and started nibbling. Before I knew it, it was all gone except for the head, and it was tasty. However, the stall owners seemed pretty amused that this foreigner was eating salted fish on its own and without cutting it up into smaller pieces first. But this was supposed to be a fish market, and I was determined to get to the part where it is said they sold everything in the sea that moves, and if you 'didn't find your fishy friend here, it probably doesn't exist'. So eastward I went, and I was not disappointed. The first thing that caught sight of my eye were the rows and rows of fishing trawlers docked here, as if they were sleeping side by side. I was awed by how large they were, and how they all looked almost exactly the same in terms of their model and make. I am a fan of Discovery Channel's series on crab fishermen in documentaries such as 'Deadliest Catch' and was looking forward to coming face to face with the claws of the mighty Korean fishing machine. Still, the biggest honour would be to check out the men behind the machines. I learnt the hard way that they didn't like to be photographed, so the telescopic zoom of G12 came into good use. A hard worker pulls a caravan of fish waste to the dumpster. Ice boxes poured out into crates and sorted for the journey to markets all over Busan and beyond. The men would toss fish onto the backs of these lorries by the shovel fulls, but I was too late to see the dead fish fly! Some of the fish that comes off the trawlers are transported right into the building at the wharf via these overhead travelators. Next to the wharves is a large open air shed, seemed to be indicated on the street map I saw earlier as "Suhyup Jagalchi Market'. The people here seemed more 'rough necked' than the stall owners at the streetside earlier, and most of their seafood was displayed on the floor of the shed itself. There were puddles all over the floor like the stock came right off the boats parked about 30 metres away. I seemed to have arrived to late to catch any auctioning or bargaining among the wholesalers, and everyone seemed to have settled to down to sell whatever they managed to get their hands on earlier in the morning. In fact, most of them were taking out large trays of breakfast to eat while waiting for the first shoppers to stream in. Note how close the boats were parked to the market. Note the wholesalers huddled round a hot stove for breakfast. Angler fish must've been the ugliest thing on the shelves, and they were everywhere. Must be good to eat. I wonder if she's having fish for breakfast. Parts of the market selling shell fish and other non-fish marine life overflowed to the areas outside the shed and onto the roadside. I enjoy investigating molluscan species of traditional markets, and very quickly, I proceeded to do what I enjoy most! Buccinum verkruzeni Kobelt, 1883 was common in markets we visited in Seoul and Busan this season. 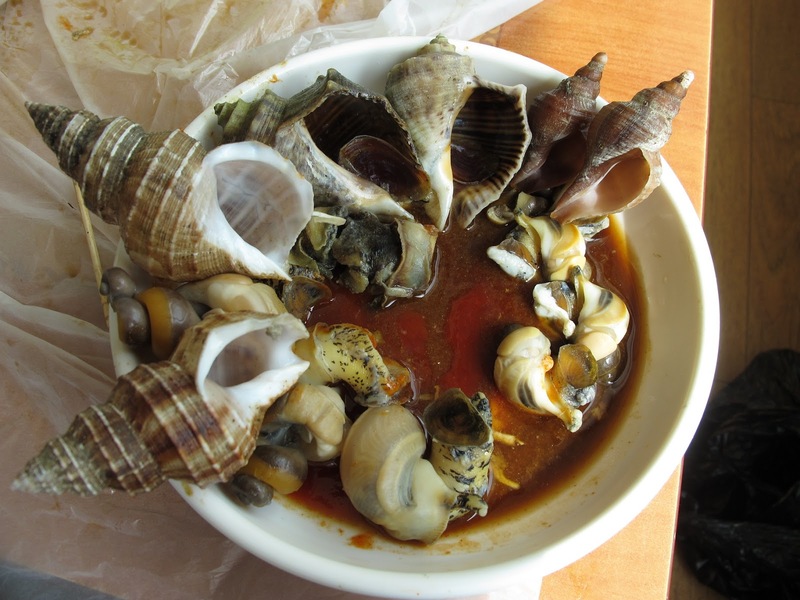 Turbo cornutus (bottom left) is large and meaty, hence popular with the locals. Displayed here alongside flower crabs and other edible whelks. In the pails at left are live octopuses. Neptunea arthritica (Bernardi, 1857) is another large, meaty and tasty member of the Buccinidae family. We tasted this at Haeundae, and we'll taste it again today! From left to right: Assorted shelled molluscs, rock whelks (Family Muricidae, Thais species), creeper snails (Family Cerithiidae). Some stowaways in the wrong trays. 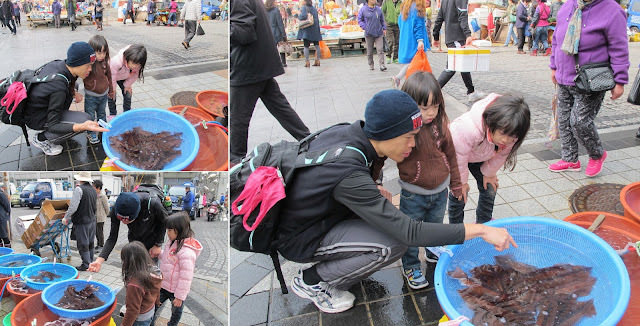 I was interested to buy them as they were less common here, but Ajumma thought I was pointing out her inept sorting skills and got upset, telling me to take them and leave. Neighbouring stall owners were amused though. Didn't mean to spoil your day Ajumma. I would've loved to have stuck around a little longer at this section but my urge to use the toilet had me move on into the main Jagalchi Fish Market building. Only the first three floors of this seven storey building are of interest to shoppers. The upper floors appear to house offices of fishery officials and departments. The first floor resembles the aquatic section of a zoo, with tanks housing everything under the Korean Sea that crawls, swims, slithers or perhaps just stays very still. Lighthouse monument with the massive Jagalchi Fisheries Market buidling in the background. 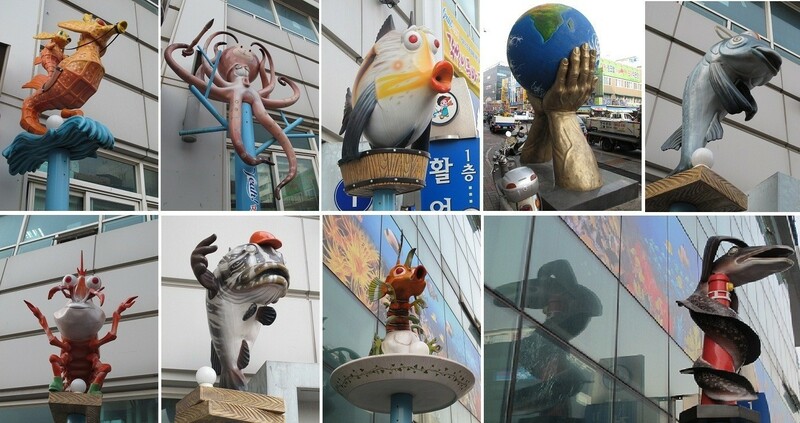 Sculptures that appear like they came out of 'The Little Mermaid' adorn the exterior of the building. "Escape alert at the King Crab tank!" Why is she chopping up frozen fish from China? It turns out it's time to feed the octopuses and expired frozen goods make good chum! The entire first floor is covered in fish tanks. Rare appearance of processed food in this section. Trays of all sorts of edible gastropods and bivalves. On the second floor, there were noticeably fewer tanks and most of the space was used for sitting areas, usually low traditional wooden platforms on which customers can sit or kneel in front of low, long wooden tables to enjoy their meals. It was still early for lunch, and the place was rather empty. Some of the stall owners mistook my intentions and touted their dishes with large printed sign boards, well prepared with English translations for tourists. The quiet before the storm... too early for lunch. Cleanest toilets you'll ever find in a wet market perhaps? Welcome to Korea! She's all prepared. Unfortunately for her enthusiasm, I'm not her first customer today. Publicity all over the place points to stalls all over the place. Next time we're here, I must try the urchins! "Tell us what you want and how you want it" with English translations included. (1) Choose your food live from the first floor or surrounding street side markets and bring it up here to the second floor. Up here, find a photograph of the way you would like your tasty friends to be prepared, point to it, then ask how much it would cost to have your purchase look like that. Agree on a price, and wait in anticipation, munching on the sides while you do to entice digestive enzymes in your mouth and gut to initiate the nutrient absorption machinery. (2) Take a seat, ask for a menu, pick a photograph you like, agree on a price, and get ready. Personally I get a kick out of having to choose what I eat, but I know that when my family comes along, they prefer stuff that's been tried and tested. Hence today, we will have a balance of both. I will describe more later at lunch time so do be patient. I ventured into the higher floors of the building but they resembled the offices of law firms in downtown Singapore, hence no point including photos here. However over the balcony of the stair well is a nice view of the wharf area and Lotte Department Store in the distance, and an aerial view of my next stop on the Jagalchi trail: "District 1 & 2 Suhyup Market". District 1 & 2 Suhyup Market appears to be a congregation of wholesalers specialising in non-fish marine products, mainly consisting of molluscs (e.g. clams and snails), crustaceans (e.g. crabs), and enchinoderms (e.g. cucumbers). It is small walled shed with most of the items displayed in crates or trays. The floor looked like a thunderstorm just passed through, so if you're keen on taking a walk around this area, have on standby an extra pair of dry socks in your day pack. If you're carried away by what you see in the distance, you fail to notice the flood waters right in front of you. Outside this building and continuing eastward, I noted that it would soon be time for me to go back and link up with the girls. I skimmed through this portion quickly and took some time to remove my outer jackets as the day started to heat up. Temeprature here was slightly higher than in Seoul, and the forecast for the next two days was clear skies. Along this area before reaching the Lotte Departmental Store, small shops focused mainly on processed and dried marine products. There were plenty of other dried items as well, such as herbs, mushrooms, potatos, and even flowers. The dried fish here appeared to be used as side dishes during meal times, along with the seaweed sold here. Typical dried marine products stall by the walking street. Dried fish, squid and octopus tentacles. I strolled back to Jagalchi Station Exit 10 to meet the VIPs, and for my opportunity to play tour guide. Upon meeting the troop, they told me that they actually made it here much earlier and had a walk around the subway mall already. However, I assured them that the best parts were yet to be, and asked Mommy which style of lunch she would prefer: Option 1: outdoors around a table with a shared hot pot of soup OR Option 2: indoors with comfortable furnishings and seafood prepared for you on the spot from a menu. Option 1 would have been an extremely traditional and unique experience, but considering the spicy nature of the soups I photographed, perhaps something milder would be good for the children. Note the jaws of the stingray! How many teeth does it have? Stingrays are related to sharks, and they have plenty and plenty of teeth. They don't need to brush them daily as when one falls out, another tooth steps up to take its place. In addition, because the ray's mouth is on the opposite side of its head from its eyes, how does the ray know what it's eating? God has given it an exceptional set of senses that allow it to figure this out without having to see its food. One of these senses are the nostrils that flank either side its mouth. If you can't see what you're eating, you need to be able to smell the difference between a crab and a stone underwater! Also, check out the fleshy lips. These help sense what an item is and whether it is safe or would likely cause a tummy upset before it is allowed to enter the mouth. 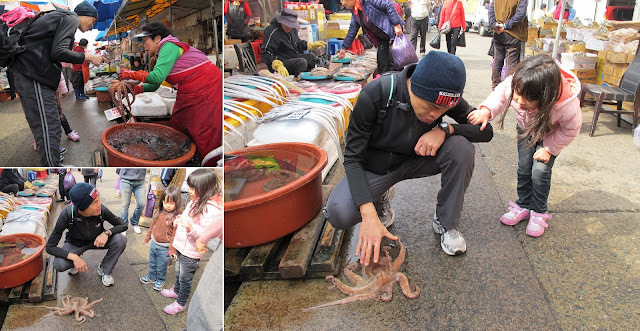 While observing the larger octopuses held in a tank, Ahjuma decided to pick one out to show us what's underneath! We get to check out the very specialised set of jaws that can deliver a nasty bite if not properly handled. We also get to touch the suckers on the tentacles and see of these help the octopus grab items and move in the water. Did you know that these fellas are also masters of camouflage? Note that all the octopuses in the pail are dark red like the pail, and the one on the floor has lightened up to try and match the floor! In fact, dead octopuses behind us are pale white, as they have lost this ability to imitate their surroundings. It's interesting how the stall owners played their part when they noticed that I was trying to expose the kids to the wonderful animal world. However when they did so, the girls didn't seem to appreciate it very much and would much rather observe them through the glass in the tank. Here, Ahjuma picked out a specimen for us to have a closer look at the crab's hairy legs! Another natural wonder must be the growth cycle of the flatfish, or sole. Adults appear to have both eyes on one side of their face and are constantly lying down on their side. However, they weren't born this way, and it's a physiological wonder how this transition takes place as the fish matures! Perhaps if we slept on one side all our life, we'd have eyes on one side of our face too! Okay, I'm imagining too much now. Squid! Hmmm, have you ever wondered which way is it's head? Is it really moving backwards? If it is moving forwards, then why is its mouth at its backside between its legs? Look at its large round eyes looking back at you. Perhaps it can see you as well as we can see it! Like its relatives the octopus, squid also have the ability to change colour. In fact, we had a chance to alarm one of them and noted a faint flashing warning through its skin. All this talking is making me hungry. It's time to settle down for the meal of the day! A slice of pumpkin, boiled brocolli stalks, sliced carrots, garlic and green chili garnishing. Cabbage covered in crushed peanuts and red sauce. Mint leaves and lettuce for wrapping the raw seafood. Pajon: a fried pancake with vegetables and seafood. A pair of raw fish sushi. Extra large raw fish platter, known in Korean as "hwe". The platter is served cold on a bed of glass noodles that are more for decoration than for eating. With the bones of the fish they have just carved up for you they boil a wonderful fish bone broth with mixed vegetables known as "Maeuntang". We had the non-spicy version so the kids could cash in on it too. One way to enjoy the raw fish: wrapped up in mint leaves with everything else! And the winners are: Neptunea arthritica, Buccinum verkruzeni, Rapana venosa, and another juvenile Buccinid I cannot identify at the moment! Armour removed and dipped in wasabe sauce! Did we manage to finish everything on the plate? Well, the answer is yes and no. Yes because we did a pretty good job with the stuff on the menu. However, I had to admit that my cooking skills left much to be desired, and Ahjuma did a way better job than I did. Hence, some of the snails died in vain today. Next time though, it'll be a different story. Great post! Love the pictures! Do check out our post on Jagalchi Market as well!